We can produce such a wide variety of sheet metal work with standard CNC press brake tooling. Using simple V tooling enables us to cover most of the bends our customers want in their products. Sometimes however, special press-brake tooling can make a big difference. It can reduce the setting time for a number of tools and reduce programming time. The biggest gain for you is the reduced production time easily saving the cost of the tooling after just a couple of batches. By using joggle press-brake tooling a double bend can be achieved in one cycle of the machine. Not only is this quicker but a more reliable form can be achieved. 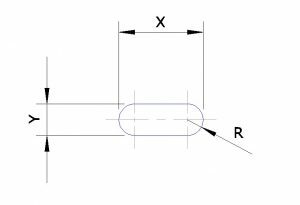 The joggle tool can be adjusted to suit a range of material gauges and offset sizes. This bracket was produced from 3mm aluminium but it could just as easily have been mild steel or stainless steel. This press-brake tooling is shown producing a joggle form in 3mm aluminium on our Trumpf 7036 CNC press brakes. The same tooling can be used on our Safan e-Brake CNC press brake making it a versatile tool for the shop floor. 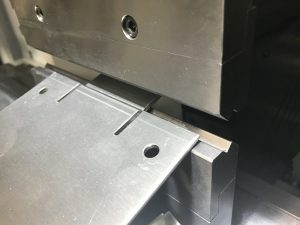 If you have a sheet metal component and you are looking to save money it might just be that bespoke press-brake tooling could make a difference. Please send us your drawings and we will quickly be able to see if we can help. Email us at sales@vandf.co.uk or give us a call on 01486 577786 if you are still now sure. Manufacturing sub-contract sheet metal is what V and F Sheet Metal are all about. We have been manufacturing in Great Britain since the 1980s. We have a company ethos of constantly investing in the latest machinery and software to improve the quality of the parts we manufacture. Managing costs and improving order lead times is an everyday job for us. 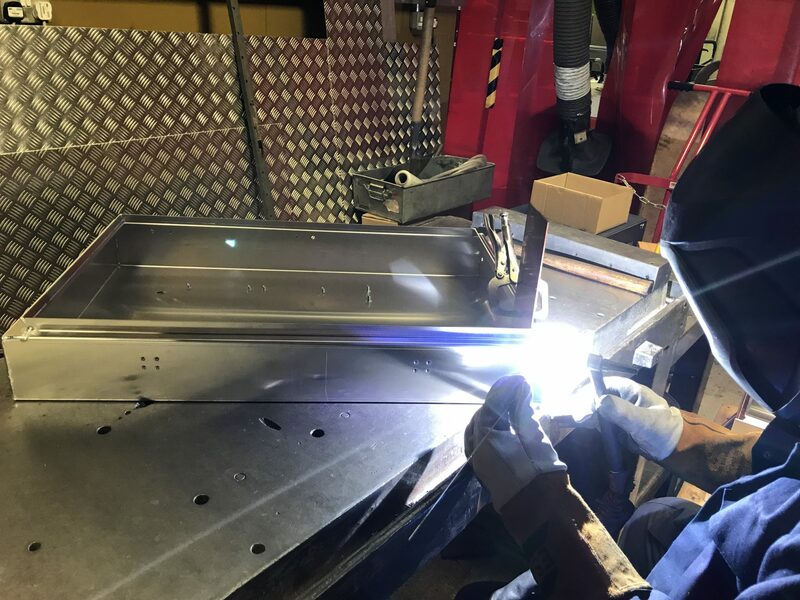 Manufacturing sub-contract sheet metal for our customers can be range from the simplest flat plate right through to complex welded fabrication assemblies. Whether we are using the latest laser cutting technology or CNC bending machines people are still the most important factor in any business. With a stable workforce we have a wide range of experience. Manufacturing special projects and prototypes to repeat batch work and kanban systems, we are happy to help you. Supporting a wide range of customers in the UK and mainland Europe we will often alreadyd have come across a solution you need. Having a large library of standard CNC punching and bending tooling we can usually produce all your work without any tooling costs. If you are looking for a long term relationship with a UK based company manufacturing sub-contract sheet metal then please contact us. We will be happy to talk to you about your latest sheet metal projects on 01489 577786. If you prefer to e-mail us your drawings then please feel free. We can work with STEP, SAT, DXF and DWG CAD data, please send it to sales@vandf.co.uk. We can produce you quote options, price ranges and advice on treatments and finishes to save you money. We use Radan sheet metal CAD/CAM software to drive our CNC punching and CNC laser cutting machines. Radan software is one of the most sophisticated packages for controlling sheet metal manufacturing machines available today. With support for 3D modelling, 2D drawing, standard tooling libraries, auto tooling and auto nesting of full metal sheets. Sheet metal programming is critical for producing accurate components at the right price. For us sheet metal programming is the most important stage in the manufacturing cycle before any material is cut. The examples of sheet metal programming shown here are typical of those we produce every day of the week. 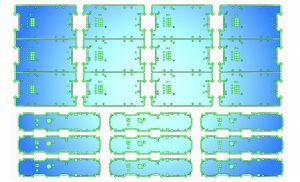 The Radan software automatically finds the best fit for components on any given sheet size or off-cut no matter how complex the blank shape or size. 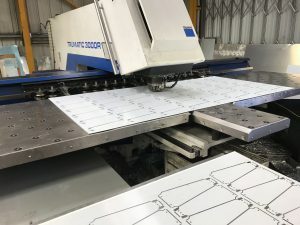 With many years of experience in producing a vast range of sheet metal parts via CNC punching and CNC laser cutting we are happy to help you modify your designs to reduce processing time and part costs. You can send us your drawings as 2D PDF, DWG or DXF files. 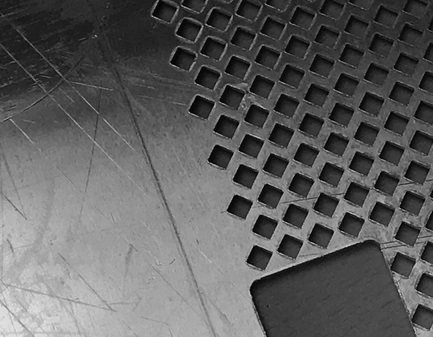 If you are lucky enough to produce 3D data then STEP or SAT files can help us to speed up sheet metal quotes and the final production sheet metal programs. 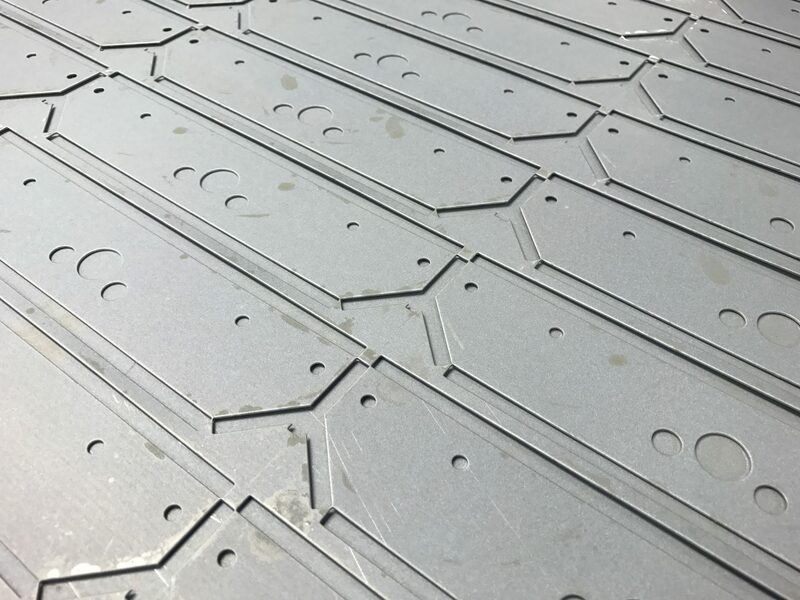 When you are looking for CNC punching of sheet metal a good place to start is V and F Sheet Metal. With 2 Trumpf CNC punch presses there isn’t much we cannot do for you. Having over 17 years of CNC punching tooling we have a large standard tool library to reduce the need for new tooling costs. The mild steel lighting gear boxes that are shown here are typical of the work we CNC punch everyday. CNC punching sheet metal with features such as ventilation louvres is quick and easy. Supported by Radan CAD/CAM software to produce the correct flat blanks and tooled nests we can easily find the most cost effective way to produce your parts. 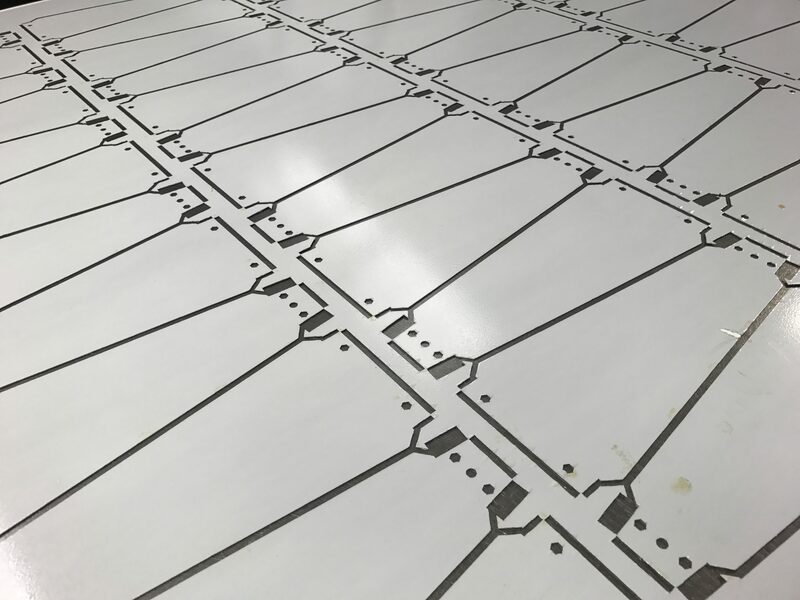 CNC punching of sheet metal including all ferrous and non-ferrous materials is possible from 0.5mm up to 5.0mm thick. If you want to have components thicker than 5.0mm then we would laser cut them with our Trumpf 3030 3KW fibre laser machine. The variety of components that can be CNC punched is truly huge, please take a look at our gallery pages for more examples. So if you have a project and it’s going to need CNC punching of sheet metal please give us a call. We are on 01489 577786 or e-mail sales@vandf.co.uk with your drawings. Our engineering team will be happy to help you. V and F Sheet Metal are specialists in sheet metal working for the lighting industry. We have been manufacturing sheet metal work for over 30 years and many of those for lighting companies. 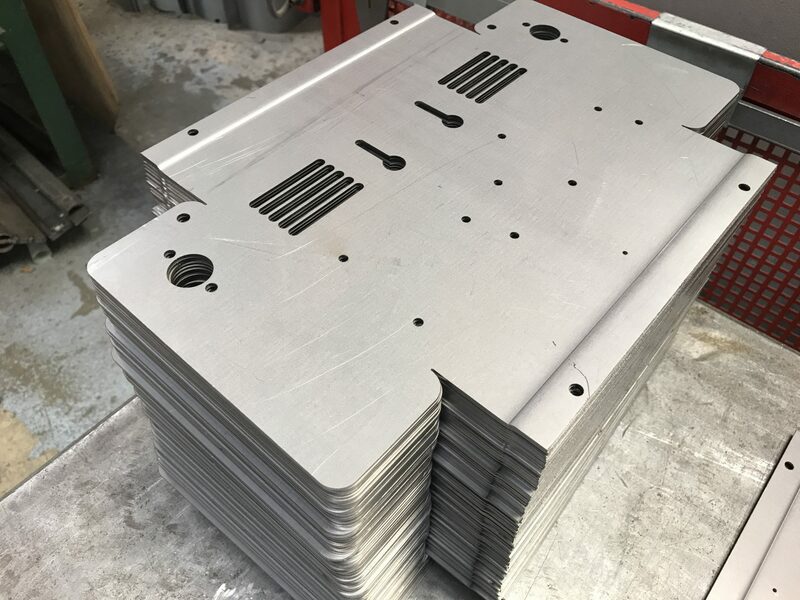 Using CNC punch presses and laser cutting machines we produce a wide range of sheet metal components and fabricated assemblies. From lighting reflectors, housings, heat sinks, lamp hold brackets to flood light stirrups and louvres we know the lighting industry very well. These housings are being CNC punched from custom sheet blanks to save material wastage and keep down the component costs. Where ever possible we will look at ways to reduce your component prices. These gear housings are used to contain control gear for industrial light fittings. 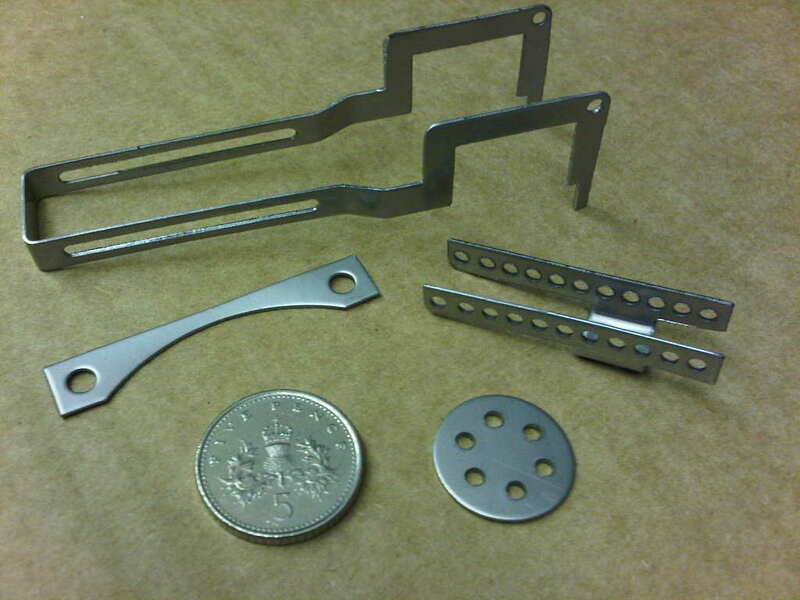 Using standard CNC punch press tooling we can manufacture components like these quickly and cost efficiently. Some of the more interesting features on the parts are the pressed dimpled feet, easy bend LED support brackets and the common line cutting. Having the right materials and tooling is essential if we are going to be able to satisfy our customers lead times. It is also important when it comes to part costing if we can use remnants from past projects. This is particularly helpful with small one off projects needing only small amounts of material. We have often seen the solution to a design problem you may have with the work we may have carried out on a previous job. Just let us take a look at your drawings and we will be happy to help suggest improvements to your designs. We can also offer you cost options to see what works for you. For more information on our lighting industry work please follow the link or take a look at our gallery pages. From the smallest angle bracket to components up to 3M long we are here to support you. But what does that mean? Well for us it means not only having the right machines and tooling, you would hope all sheet metal workers would have that. No, it means having the experience to help you with your designs. Selecting the correct materials and thicknesses for a given part with an eye to the cost of the final part. For example why would you use 5251 aluminium if 1050A will do the job and is cheaper. Many of our customers will not know what material to select and we will help them to get it right and at the right price. 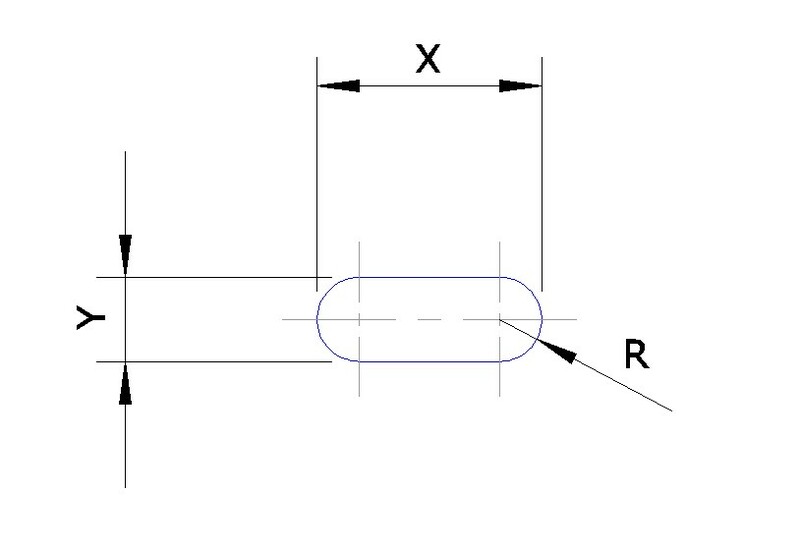 Defining a suitable manufacturing tolerance is another area where people can be unsure what can be achieved in practice. Say you want a small stainless steel channel folding up similar to the part shown on the right. It may be fitting into another rightly controlled machined item. Asking for +0/-0.25 across the bends may be required and achievable. Asking for the same tolerance on a much larger support bracket in 4mm mild steel would be adding extra time and scrap where it’s just not needed. Sometimes simply talking through these points with us is enough to get it right and save time and money in production. We have all experienced the standard drawing border that is applied to every job without any thought. So you can already see that there are plenty of actions you can take when considering designing for folding sheet metal work. The specific machine we chose and the tooling needed is not your problem. Of course you will want us to have modern accurate machines. We won’t disappoint there with a program of constant investment in plant and tooling. Getting your design right for that tooling is your problem and we are always happy to help you with it. If you want to discuss a current sheet metal project that will need folding please give us a call on 01489 577786. Alternatively you can e-mail us your drawings and we will be pleased to review them for you. I thought it would be good to show off a few sheet metal jobs that have been bent up on our Trumpf 7036 CNC press brakes. These jobs nicely show the versatility of bending sheet metal work on these fast and accurate CNC press brakes. With a large range of tooling that can be shared across all the machines we can tackle all sorts of jobs. From the smallest angle bracket the size of a finger nail right up to 1M on these machines. We can fold up to 3M on our Safan e-Brake CNC press. With sub-contract sheet metal work being so varied they machines are perfect for us. Being so easy to set up when bending sheet metal work in small batches these machines are very cost effective. As well as our 3 Trumpf 7036 CNC press brakes we also have 2 small Guifil CNC press brakes, an Edwards Pearson 2.5M CNC press brake and a Safan 3M CNC press brake. Please visit the plant pages for these machine or see them in action on our YouTube channel. There is a link at the bottom of the page. When we are asked to produce sheet metal work we may choose to use one of our CNC punch presses. Having both Trumpf 200 and Trumpf 3000 CNC punch presses we have plenty of capacity to handle a wide range of projects. If we select this production method we will need to have the collect tooling to produce all the details for that part. That may include the outer profile of the parts and any internal details. These could be simple round holes or more complex cut-outs. By combining a range of shapes a wide variety of profiles can be achieved with standard CNC punch tooling. 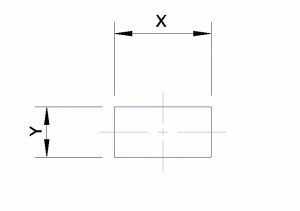 The images here cover the most common shapes that are requested by our customers when manufacturing their sheet metal work. They include circles, squares, rectangles, obrounded slots, corner radiusing tooling, single D and double D tooling and banana tooling. 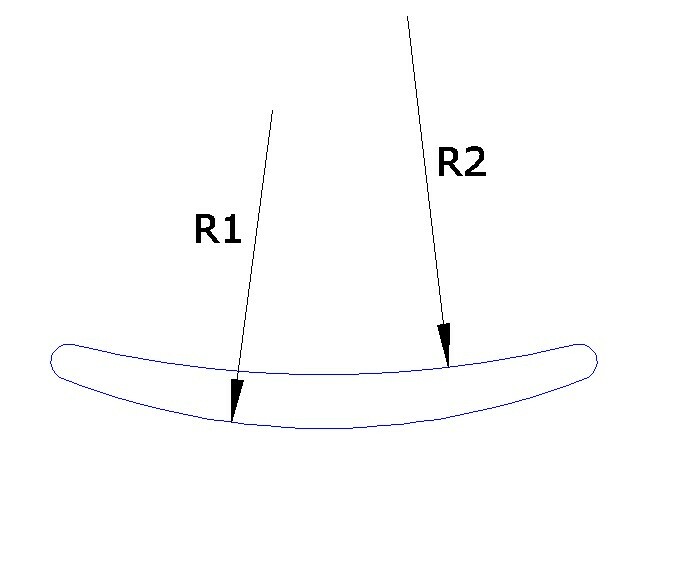 The banana tooling is used to produce larger inner and outer circles for round cut-outs and discs. We have plenty of standard tooling on the shelf ready to use on your sheet metal work. If you want to see more for yourself please take a look at our CNC punch tooling tables. Since we pride ourselves on being able to offer a wide variety of sheet metal working services we can also laser cut in house. This is the perfect process for manufacturing more complex shapes that would be more difficult to CNC punch with standard tooling. We will automatically select the best manufacturing process to suit your design and the volumes that you might need. Our Trumpf 3030 fibre laser is the ideal tool for the sub-contract sheet metal worker. So if you have a sheet metal product and you want us to provide you with an estimate simply give us a call. Alternatively you can e-mail over your drawings if you wish and one of our engineering team will have a look for you. 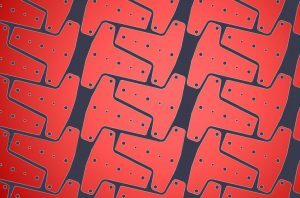 Why do we CNC punch plastic coated sheet metal? There are 2 forms of plastic coating on sheet metal. They basically split into plastic that is applied to protect the sheet metal and plastic that is a cosmetic finish. A peelable low tack plastic film can be applied to sheet metals like aluminium and stainless steel at the material stockists. These materials can then be CNC punched or laser cut leaving the plastic film in place. This plastic film helps to protect the sheet metal surface from scratches, finger prints and oil. They can be left in place during subsequent operations such as CNC bending, CSK, rolling and during the insertion of bushes. They do have to be peeled back locally where any heat is applied such as spot welding joints or TiG / MiG welding corners. The second “cosmetic” plastic coating is similar to pre-painted materials. This plastic coating will also have a peelable film to protect it during manufacturing. The coating again can be CNC punched but not laser cut. The coatings can be specified in different colours and textures and are used in place of painting or powder coating finishing processes. Here I have shown a great example of CNC punching plastic coated sheet metal. These end plates have been CNC punched on our Trumpf 3000 CNC punch press using a common line programming technique to reduce punching time and saving materials used. 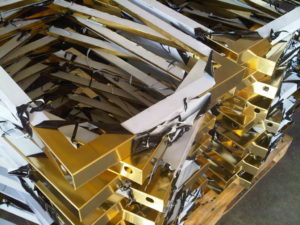 Perhaps you are currently purchasing a sheet metal component that you are having painted or powder coated. It might be worth considering a pre-painted / plastic coated material. We often look at parts and with a small design change we can reduce costs and reduce production leads times. If you want to know more about these materials or want to see some samples please contact us on 01489 577786. 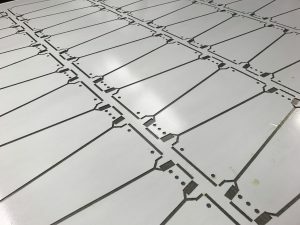 CNC punching plastic coated sheet metal is just one of the manufacturing techniques we use to save time and money for our customers. 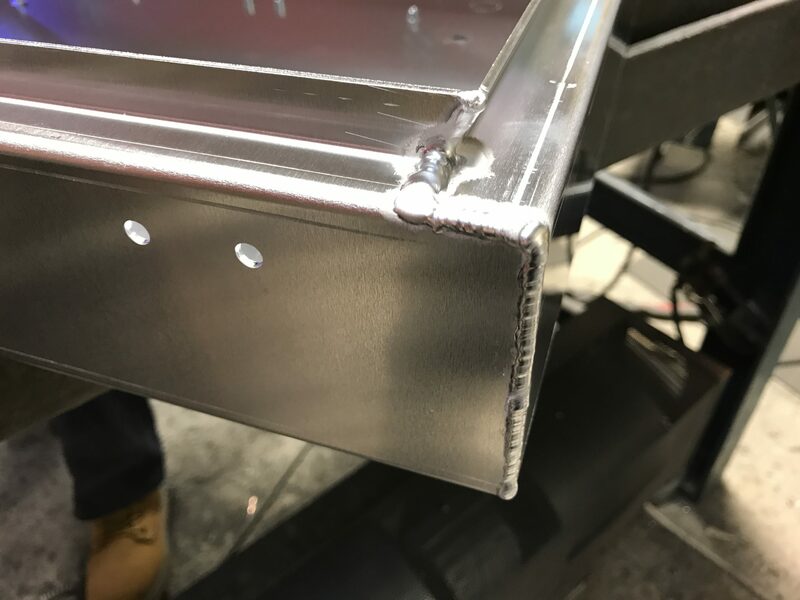 Please take a further look at these blog posts for design ideas to improve your sheet metal designs. 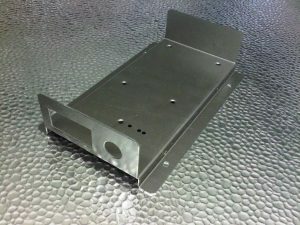 Sheet metal can be used to create a wide range of housings, enclosures and boxes for electronic and lighting products. Whether the housings are made from stainless steel, mild steel or aluminium we have the correct equipment for efficient manufacturing. 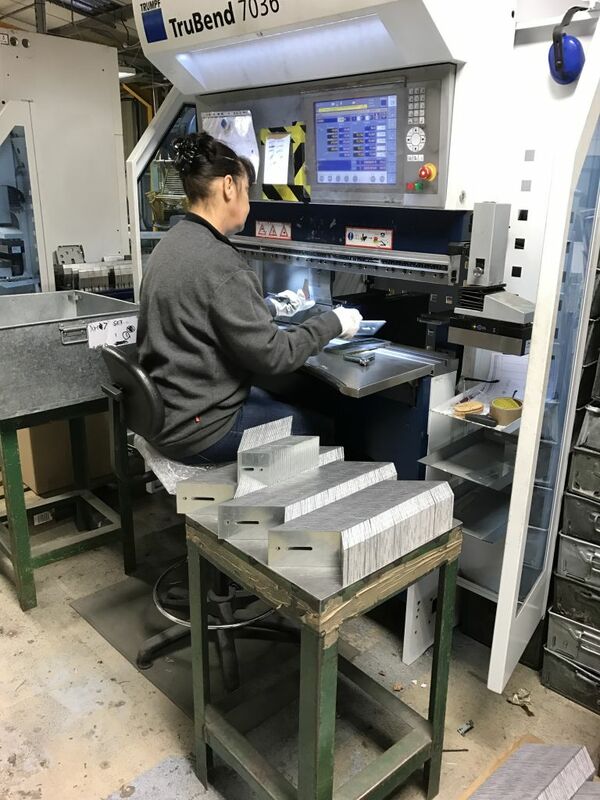 With a varied customer base demanding a quick service from just a few samples right up to volume production we have a large flexible sheet metal housing production service. Whether it’s CNC punching or laser cutting that’s needed to start off a sheet metal housing we have the right software to get the best from any given sheet of metal. Using either fresh standard sheets, custom sheared blanks or remnants from previous jobs we can cope with your requirements. Radan CAD/CAM software is very powerful with it’s ability to change a part from CNC punching to a laser cutting job in seconds. This allows us to swap production jobs around when that inevitable panic order comes in. 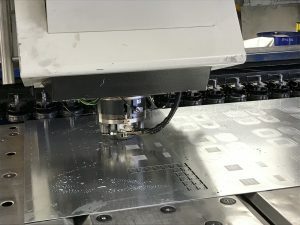 Linking the flexibility of CNC punching and laser cutting under the same roof as CNC bending is perfect for most people’s sheet metal housing needs. Bending housings as small as the palm of your hand right up to 3M long is no problem for us. With many of our CNC bending machines sharing the same tooling enables us to be flexible when running higher volumes of work. We can set up the same part over several machines to increase work flow when needed. These small housings are typical of the easier parts we manufacture. If you have something more complex please don’t hesitate to contact us and we will be happy to take a look for you. Whether it’s a 3D STEP file or 2D data please give us a try. Whether you are looking to just have a few stainless steel parts laser cut or higher volumes here at V and F Sheet Metal we will be able to help you. Using the latest Trumpf 3030 3KW fibre laser technology we can cut work from 0.3mm to 12mm thick. Using a fibre laser enables us to offer you a comprehensive laser cutting service. We can laser cut ferrous and non-ferrous materials. As well as stainless steel this can include aluminium alloys, mild steel and galvanised steel. Using the fibre technology we can cut brass and copper alloys. Employing either nitrogen, oxygen or compressed air as the cutting gases we can ensure the best edge quality to suit your needs. This also helps us to select the right solution to keep your finished part costs down. Laser cutting stainless steel is only one service we offer our customers. For a fuller picture please take a look at our plant pages and galleries. If you have a design that needs sheet metal work please give us a call. Our engineering team will be happy to help you and talk through your ideas. Sheet metal work can come in all shapes and sizes and these small sheet metal components are certainly at the lower end of our range. Manufactured from stainless steel by CNC punching and CNC bending they nicely show the complexity that can be achieved with sheet metal work. They could so easily have been laser cut but having both processes in house we can pick and choose the process that suits the parts. This can be particularly helpful when moving from prototypes and small batches through to higher volumes. 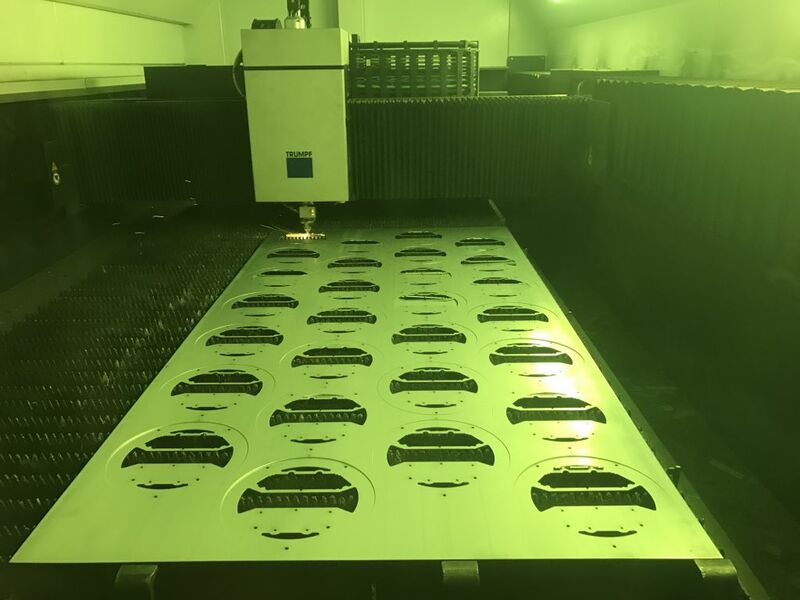 One process, say laser cutting, may be perfect initially then with higher volumes and some simple tooling CNC punching may lend itself to be the most efficient manufacturing process. Small sheet metal components also present problems if they have to be folded up. We are fortunate in having 3 Trumpf 7036 CNC press brakes which are ideally suited to folding small sheet metal components. 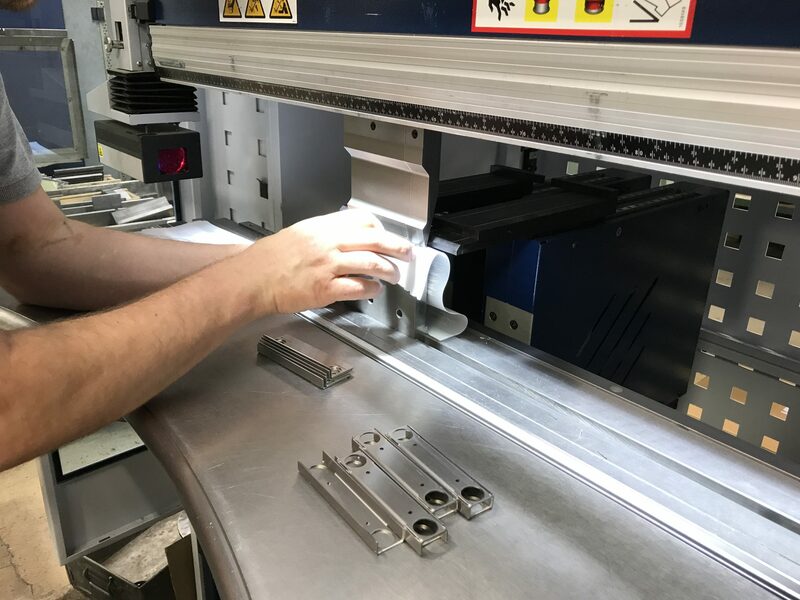 With a large range of tooling and an experienced team of machine programmers there aren’t many parts that we cannot fold up whatever their size. If you have some small sheet metal work that might need to be manufactured please give us a call. We are always happy to take a look at new projects are see if we can help you save money with a small design change. We can offer you free advice to improve material usage, reduce production time and select the most appropriate material type and finish. If you have some drawings please e-mail us on sales@vandf.co.uk. If you just want to chat through your ideas please call us on 01489 577786 and we will be happy to talk. Here I thought I would show you a small range of the sheet metal work that we have just CNC punched today. CNC punching sheet metal in the UK can be so varied. 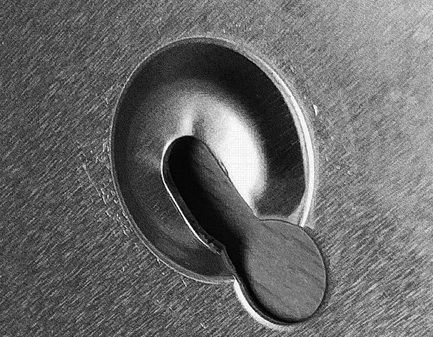 We can CNC punch components from stainless steel, mild steel and aluminium as well as copper, brass and a range of pre-coated materials. With a wide range of standard tooling most work that we take on for our customers needs no new tooling. Special features such as dimples, plunged screw threads and ventilation louvres can be quick and easily produced with the right tooling. 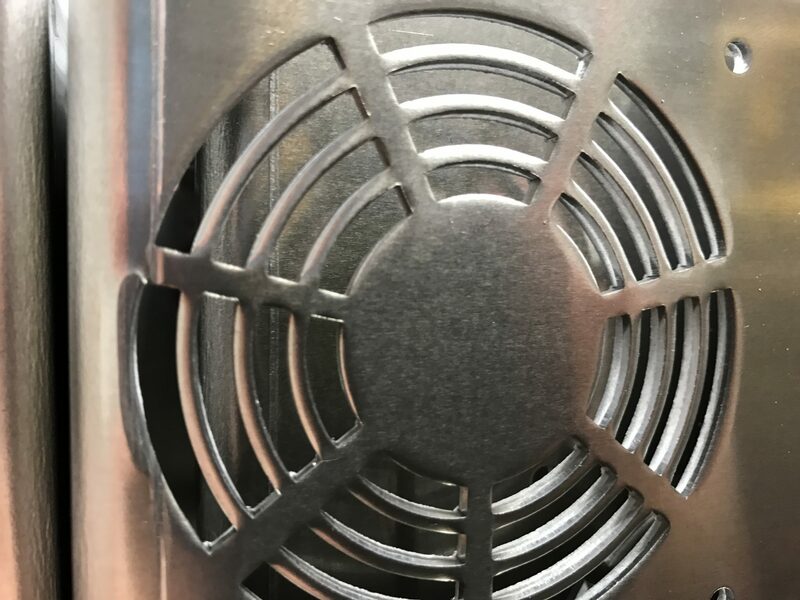 You can see that these mild steel ventilation covers have been CNC punched in two directions to get the best from the material sheet. This technique is easy for us with our Trumpf machines and their single head design. 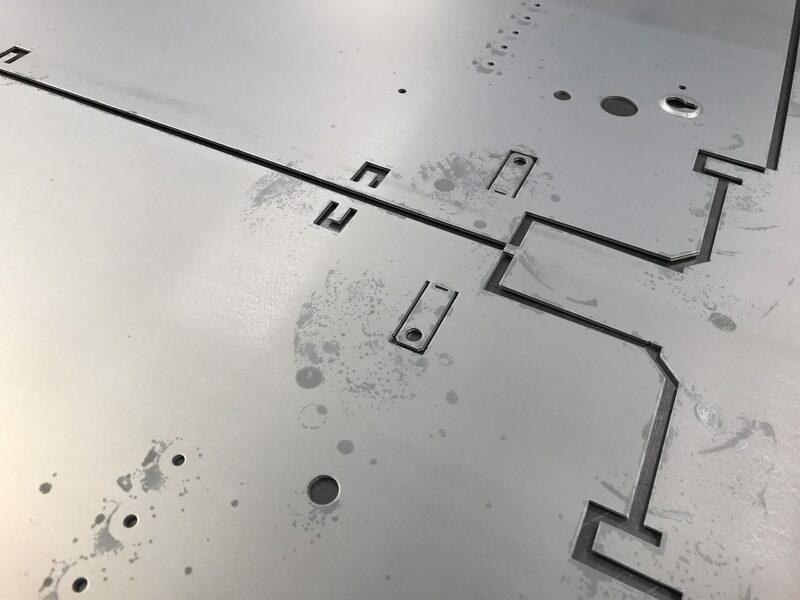 Combined with the power of our Radan sheet metal software we can offer a great service for CNC punching sheet metal in the UK. Zintec is a material that we often use for our customers. It’s an ideal material for CNC punching and we process it from 0.7mm right up to 3mm thick. All the tooling that we use to CNC punch zintec is the same as that which we use for mild steel, stainless steel and aluminium. CNC punching sheet metal in the UK is the perfect solution for manufacturing many of these parts. 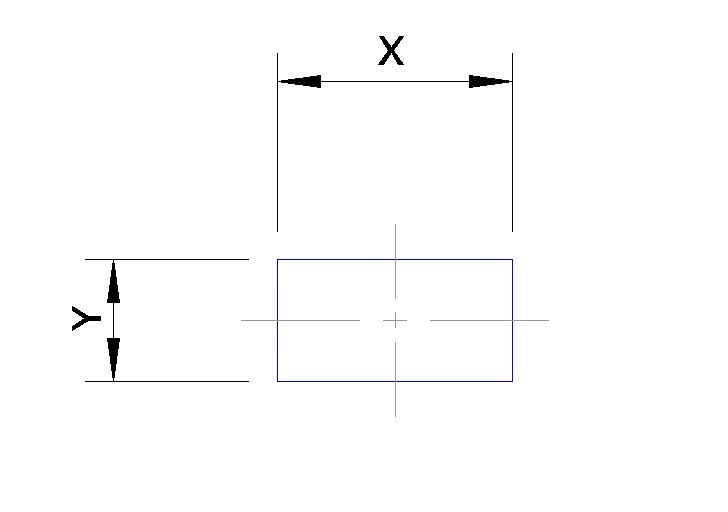 Some parts with straight sides can be placed together and cut at the same time. 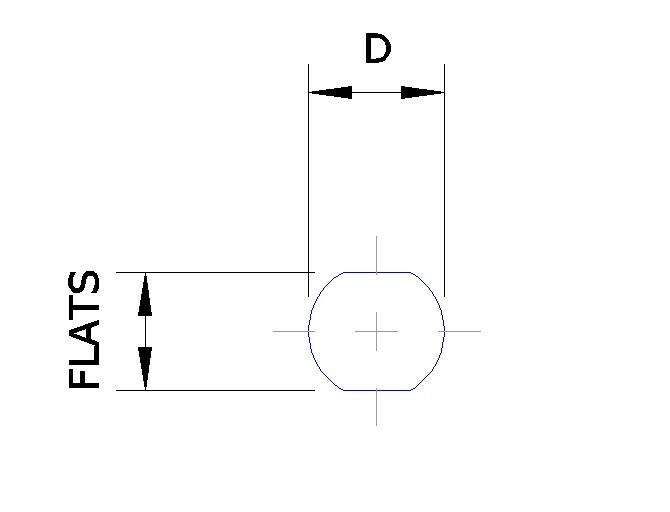 This CNC punching technique is known as “common line cutting”. It helps to reduce punching time and materials adding to component part cost savings. If you have a sheet metal project and you think that our CNC punching service can help you please take a look at http://www.vandf.co.uk/plant-list/trumpf-200r-3000r-cnc-punch/ and then give us a call and we will be happy to help you. When we are looking to fold sheet metal components we have a number of options here at V and F Sheet Metal. We have a number small CNC press brakes for folding sheet metal work up to 1M long. We also have a 2.5M long machine for forming longer channels and angles. But when it comes to more complex sheet metal work we would use our Safan e-Brake with it’s 3M long bed and 100 tons bending force. 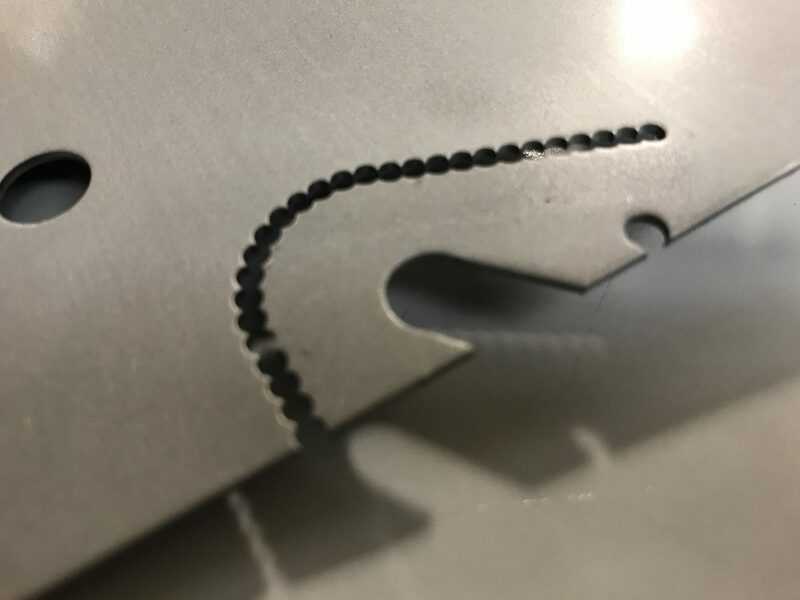 The video shown here is bending a typical simple sheet metal tray and it nicely shows the speed with which work can be formed. Folding sheet metal work needs a good machine, accurate tooling and a skilled work force. The Safan e-Brake is a great machine to program with an easy to understand controller. As we are a sub-contract company we need to be able to move from job to job quickly. Some job changes can take just minutes and with small batch sizes this is essential to get the best from the machines. 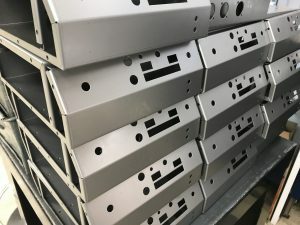 All our CNC bending programs are saved to our system server and then backed up over night to ensure we also have the right data ready when needed. 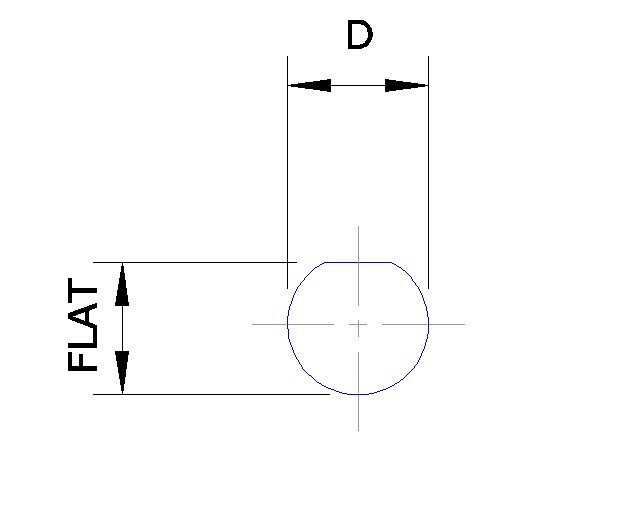 To achieve an accurate final folded component you need to start with an accurate flat blank. We are lucky to have Trumpf CNC punch presses and a Trumpf laser cutting machine. These machines enable us to produce the correct parts every time. Using Radan sheet metal CAD/CAM software we are able to select the best flat blank production method to suit the parts details. The final folded trays are stacked and ready to move to their next production process. The secret to folding sheet metal work is to keep it simple. Easy to use machines, clean accurate tooling, accurate flat blanks and a wealth of experience. This enables us to offer the best solution for folding your parts and keeping the costs down. If you want to know more or would like us to quote you for your sheet metal work please send us your drawings or give us a call on 01489 577786. 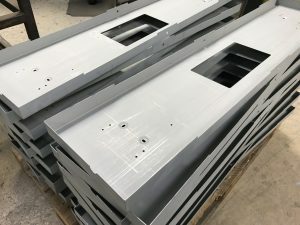 If you are looking for sheet metal working in Hampshire Great Britain then a good place to start is with V and F Sheet Metal. 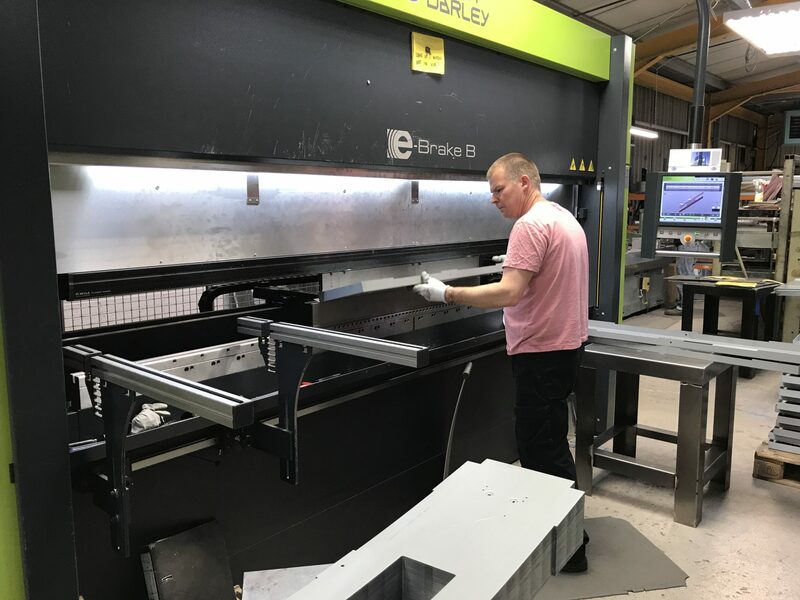 V and F Sheet Metal have been manufacturing sheet metal work for over 30 years and are proud of the service we offer to companies all across Great Britain. Using the very latest CNC punching, laser cutting and CNC bending equipment we can satisfy all your sheet metal working needs. From simple flat plates, angle brackets and boxes right up to complex multi-part assemblies we can support you. Anywhere from sample parts to larger repeating batches and high volume requirements we have the plant and people to help you. We have always been happy to help our customers with their needs and advise where we can to reduce time in manufacturing to save them money. Perhaps we can do the same for you, call us on 01489 577786 for more information. 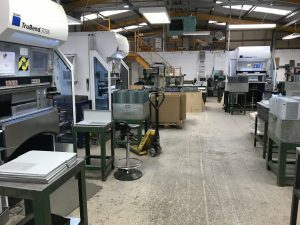 With so much equipment we have the flexibility to help you if you have an urgent requirement, repeat batch work, call-off needs or higher volume orders. If you want to send us your drawings or 3D models please send them to sales@vandf.co.uk and our engineering team will be happy to help you. Also, please take a look at our website and you will see plenty on past sheet metal working projects. These can often help you with design ideas and illustrate the wide range of items that can be manufactured from sheet metal. If you would like to see one of our Trumpf 7036 CNC press brakes in action follow the link. So if you are sheet metal working in Hampshire Great Britain and you are passing the door please call in for a look around and discuss your sheet metal project. 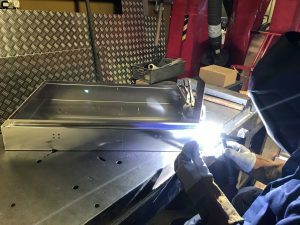 Whether it’s TiG or MiG welding we can supply your sheet metal aluminium fabrication needs. 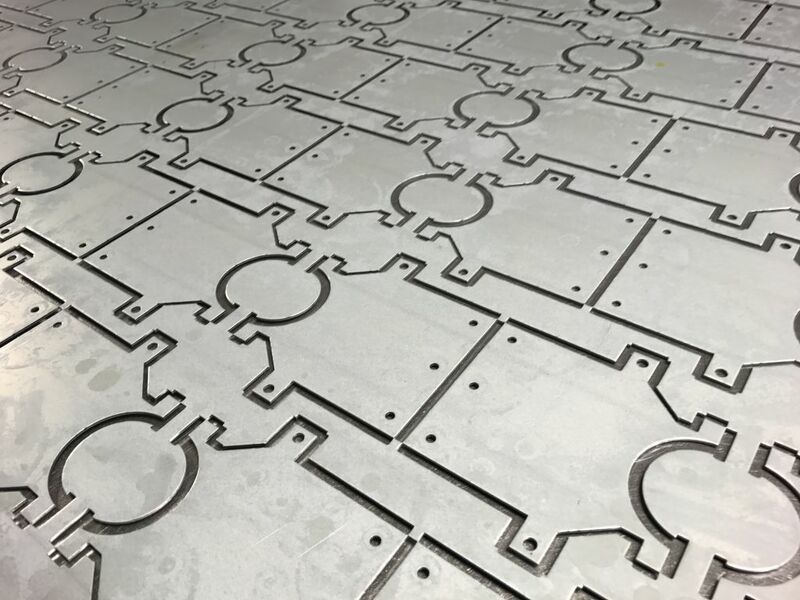 Producing all our sheet metal blanks from the best CNC punching and laser cutting machines enables us to produce very accurate weld joints. This saves time and money when it comes to welding and reduces the amount of cleaning up that has to be carried out after welding. If you are looking for aluminium housings, boxes or enclosures we can help. Using Radan CAD/CAM software to plan out the exact fit of the parts to save time in production. We can build in location tags and slots to simplify assembly and ensure the correct alingment of fabrications. Along with aluminium fabrications we can also weld stainless steel, mild steel, zintec, galvanised steel and brass. Take a look through our website recent fabrication projects, blog posts and galleries to see just how many people we help with their products. 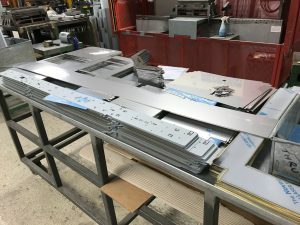 So if you need aluminium fabrications to complete your products and you want to purchase them from a supportive supplier in Great Britain why not contact us on 01489 577786. 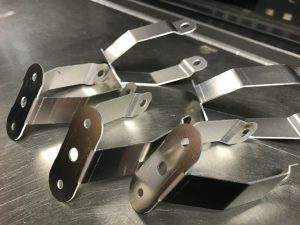 If you are looking to have sheet metal brackets made in Great Britain then V and F Sheet Metal are a great place to start your search. 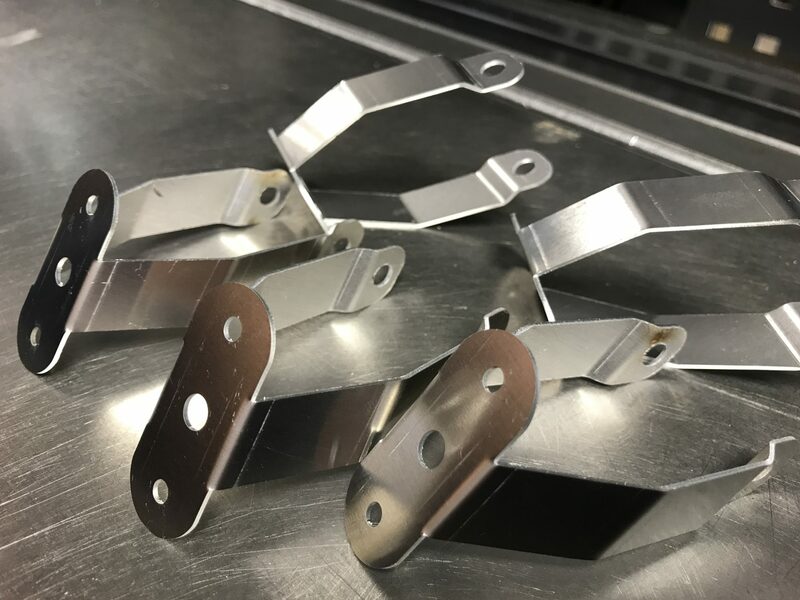 With decades of experience in manufacturing sheet metal brackets for a wide range of industries we can help you with your designs as well as the bracket production. 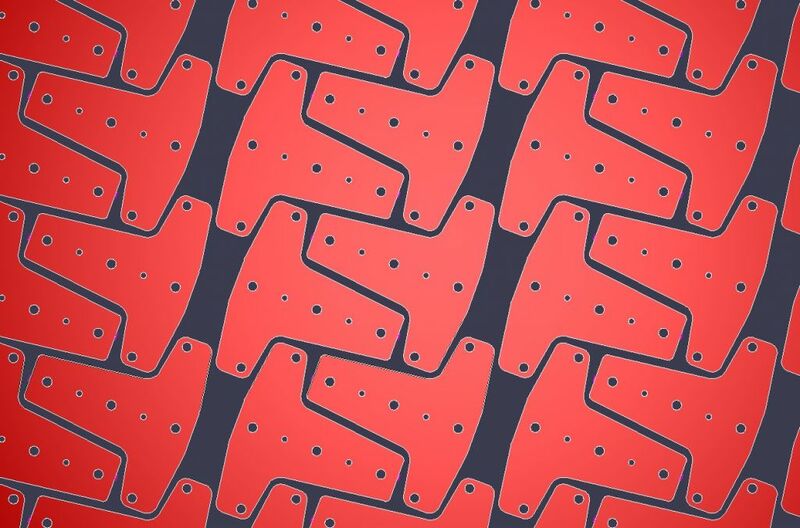 Brackets can be produced by either CNC punching or CNC laser cutting from a wide range of sheet materials. The majority of our bracket manufacturing then passes through our CNC press brake section where all the folds, joggles and safe edges are produced. We have 7 CNC press brakes using a wide range of tooling from small 600mm machines up to 3000mm 100 ton machines. 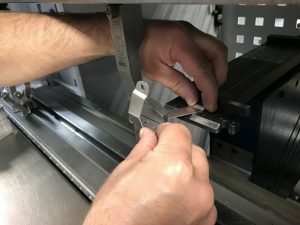 The brackets shown being folded here are being manufactured on one of our Trumpf 7036 CNC press brakes. Here’s the final finished aluminium sheet metal brackets. These particular brackets are used with a fibre optic lighting system and were manufactured in a batch of 250 parts. If you were to place and order with us all the design work for your brackets would be carried out using Radan CAD/CAM sheet metal software. We would produce 3D models, developed flat blanks and the fully tooled CNC punch or laser cutting nests. The CNC programs are then ready for production direct to the correct machine at the right time for your order. So if you still want sheet metal brackets made in Great Britain please pick up the phone and call us on 01489 577786 or e-mail us your drawings to sales@vandf.co.uk and we will be happy to help you. Sheet metal work in Great Britain can take many forms. From simple CNC punched electronics front panels from aluminium alloy. Stainless steel welded fabrications used in the pumping or pharmaceutical industry. Mild steel components for industrial light fittings and ventilation grilles for the heating industry. 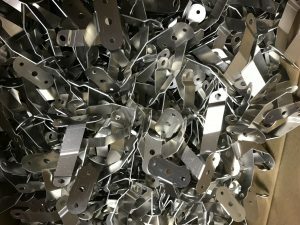 These are all sheet metal components we often manufacture in our factory in Hampshire, Great Britain amongst thousands of other components. When you are next looking for sub-contract sheet metal work in Great Britain V and F Sheet Metal is a good place to start. With a friendly attitude to work and the ability to support you throughout your design process we are far more than just a “tin basher”. Here’s a great recent image of sheet metal work in Great Britain that we have made using all in house equipment. 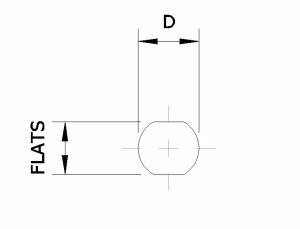 From using the latest CAD/CAM sheet metal development software to correctly calculate the blanks sizes. Laser cutting the flat sheet metal blanks. Minimal edge de-burring and CNC folding to create a finished electronics housing chassis. As well as standard housings folded with simple 45 and 90 degree bends we are asked to make far more complex shapes. 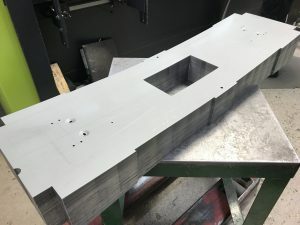 By using 3D CAD/CAM to model these complex sheet metal components and the very latest CNC press brakes we can often manufacture items for you without the need for special tooling. 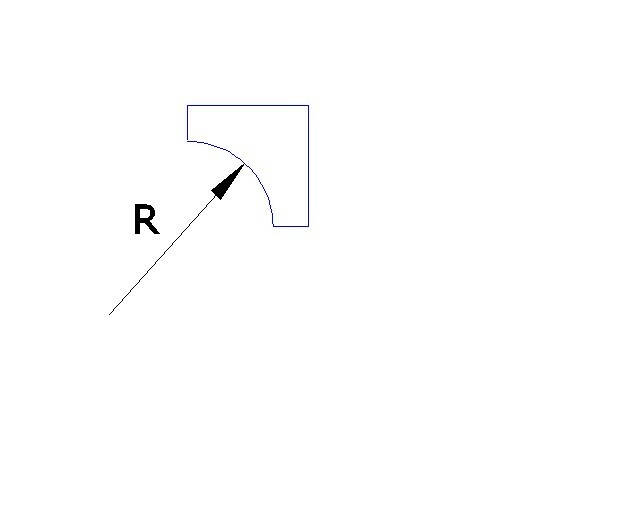 By using a series of small bends, each step can produce a part of a much more complex compound curve. Through trial and error and flexible shop floor programming techniques most shapes are achievable. As you can see sheet metal work in Great Britain covers a wide range of designs and materials. To take a look in more detail at all the sheet metal machines working our YouTube channel is a good place to start. So what do you do now? Well you can give us a call on 01489 577786 and we will be happy to have a chat on your requirements. If you already have a fixed design then we will be happy to take a look at you CAD files whether they are in 2D or 3D format. We can produce range of prices for different volumes, design options and treatments or finishes that you require. 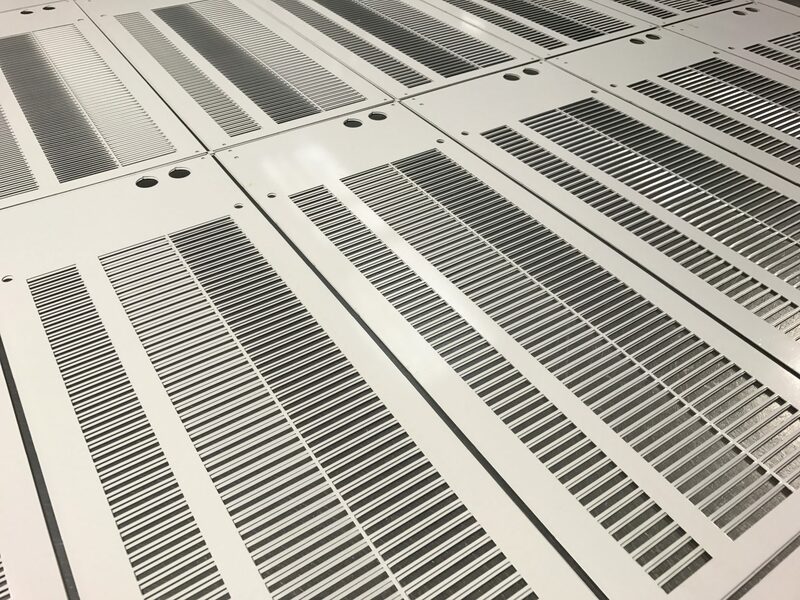 It’s always been our aim to provide a flexible, quality CNC punching service at a competitive price right here in Great Britain. 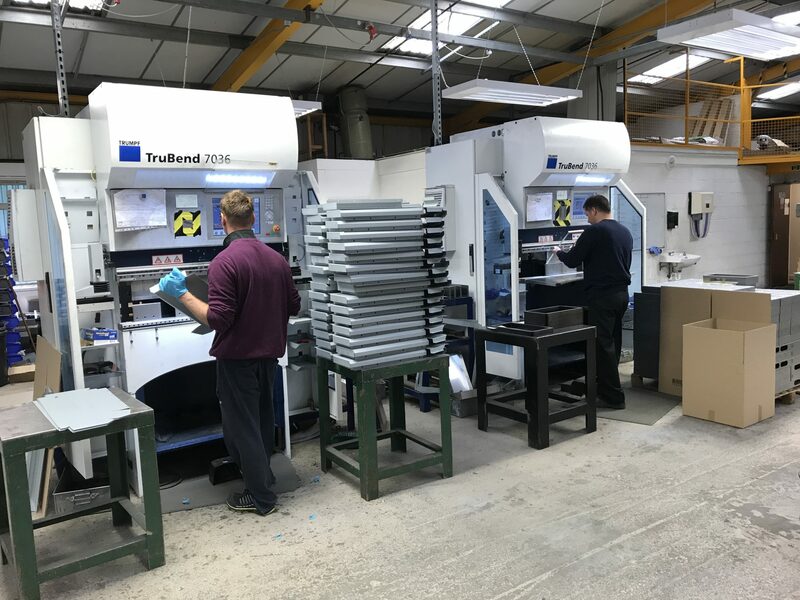 Investing in Trumpf CNC punch presses supported by Trumpf tooling and the latest Radan CAD/CAM sofware V and F Sheet Metal offer the complete CNC punching service. Our Trumpf 3000 is shown here working with 0.7mm thick pre-painted white mild steel sheet. By bringing in panels cut to the most effective size waste can be kept to a minimum. CNC punch presses are perfect for producing thin gauge sheet metal components, especially if they are pre-painted or pre-anodised. If however you have requirements for components with thicker gauges then our Trumpf 3030 fibre laser will be just the machine to cut those components. Being a fibre laser cutter it can also handle your copper and brass sheet metal needs. The CNC punching techniques used to produce these panels included common line cutting to reduce time and materials. 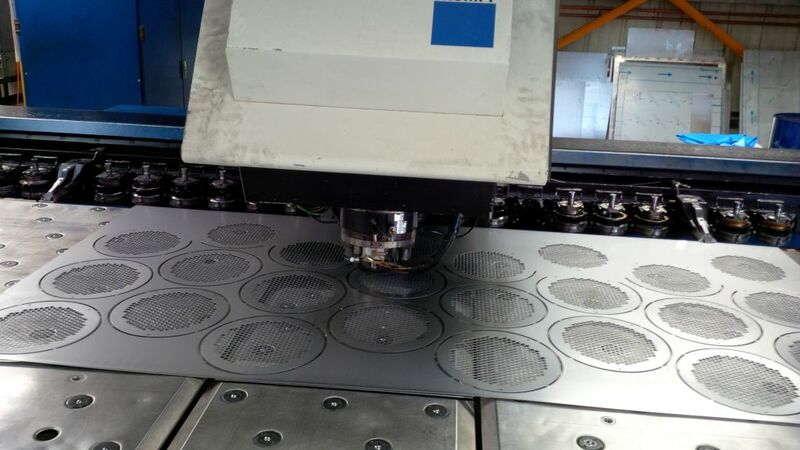 We also used the Trumpf’s programable head to produce flat panels when CNC punching the ventilation slots. Our customer’s are increasingly finding that Great Britain is the right place to source their sheet metal work. With no language barriers, quick turn around times and no fluctuating currencies we can offer a stable helpful service. Sheet metal manufacturing is so much more than just “tin bashing”. Take a look at our website for more insights into past sheet metal projects and the help we can give you with your designs. For lots of examples of CNC punching take a look at our YouTube channel. 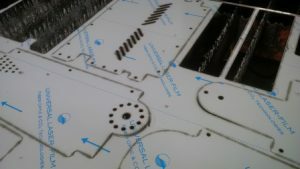 If you are looking to get CNC punching sheet metal work in Great Britain it’s easy. Just send us your drawings or call us and we will be happy to discuss your sheet metal project needs. When we need to manufacture simple sheet metal components such as these mild steel straps there are a number of ways to go about it. We could simple cut the straps to size with a guillotine and then pierce the holes using a fly press. Many years ago this would have been the preferred method of production if the volumes were not high. If the volumes were high then perhaps a dedicated press tool would have been designed and constructed. This tool would have allowed us to produce the parts quickly and cheaply. The downside would have been if any design changes were needed to the part then tool changes were expensive. We would then have moved on to CNC punching mild steel straps such as these shown in the video. This method of production allowed more freedom to change with any customer design changes. No hard tooling but software changes makes CNC punching a versatile manufacturing method and one that is still viable today. We finally end up with laser cutting mild steel straps. No tooling and complete freedom to change design when needed but with quick set up times. Laser cutting is perfect for these mild steel straps and the volume which was 750 parts were produced very quickly. The Trumpf 3030 fibre laser shown in the video is laser cutting mild steel straps with oxygen. Any edge cutting oxidisation would have been removed when the straps were zinc plated and clear passivated. If the straps were to be powder coated we would have laser cut with pure nitrogen to remove any cutting oxidisation. 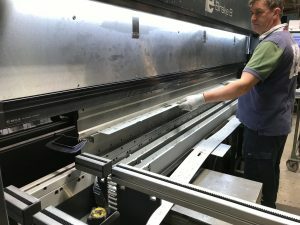 Connecting the laser cutting machine with powerful modern sheet metal work CAD/CAM software such as Radan enables us to get the best out of the machine. 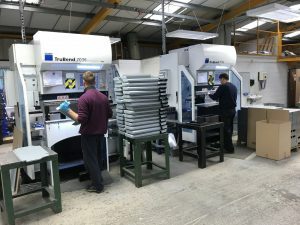 With the ability to change production jobs between our 2 CNC punch presses and laser cutting machine when needed enables us to be more flexible with work loads. It also enables us to bring more capacity to a large project when needed producing across all 3 sheet processing machines when needed. 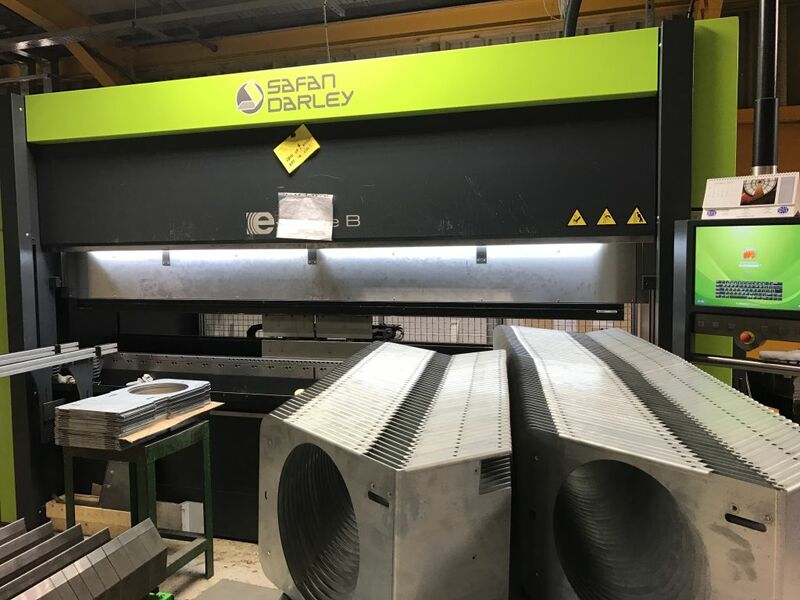 Please take a look at our site to see some of the recent laser cutting sheet metal projects we have been involved with and how we can help you. 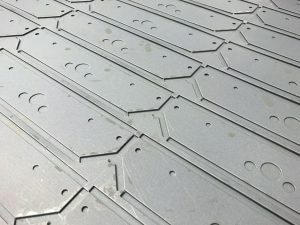 Where can I buy CNC punched sheet metal work to my designs? As a user or CNC punch presses now for over 25 years we know a thing or two about using them to produce sheet metal work. Having started with small turret machines and then larger faster turret machines we progressed to the single punching head design. As Trumpf are the best machine manufactures offering this flexible machine design, Trumpf if what we have. With this single head design CNC programming becomes much easier and more efficient when it comes to production runs and small batches. The ability to turn any CNC tool to any angle enables us to produce more complex sheet metal components and with less tool changes. Added to the quick set up time needed on our Trumpf CNC punch presses we can offer a very flexible and competitive CNC punching service to produce your sheet metal designs. Couple this with the power of Radan sheet metal software and you have a winning formula. The Radan software really gets the best out of the machines and enables us to quickly transfer work from one to another when production requirements need to be met. Interesting example of CNC punching mild sheet sheet metal circles using a “banana” CNC punch tool. 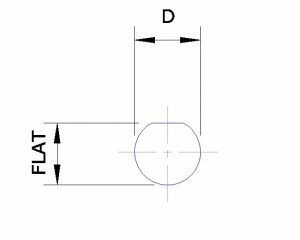 Tools like this enable a smooth outer circumference to be produces on a disc with just a few hit, again saving time and money. With a huge range of CNC punch press tools in stock here you can use them to save you tooling costs when producing a new design. 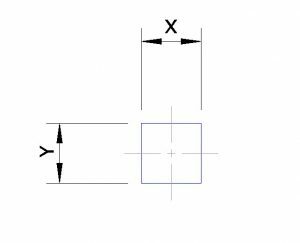 For more data, take a look at our Trumpf Standard 2D Tooling pages. 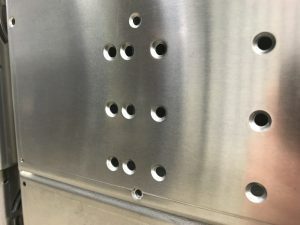 Call us and we will be happy to go through your designs and see how they can be effectively CNC punched from sheet metal. When we need to produce light fitting reflectors for our UK customers we nearly always use our Trumpf CNC punch presses. 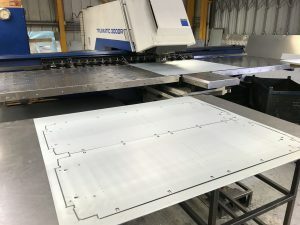 Although our Trumpf 3030 fibre laser cutting is a very flexible and capable machine it cannot cut special reflector materials as cleanly as our CNC punch presses. The punch presses use no heat to cut holes and edge profiles so there is no chance of burning edges. There is also no melting of protective plastic films. Light fitting reflectors come in a vast range of shapes and material types and CNC punching is the best way to produce them for small to large volumes. 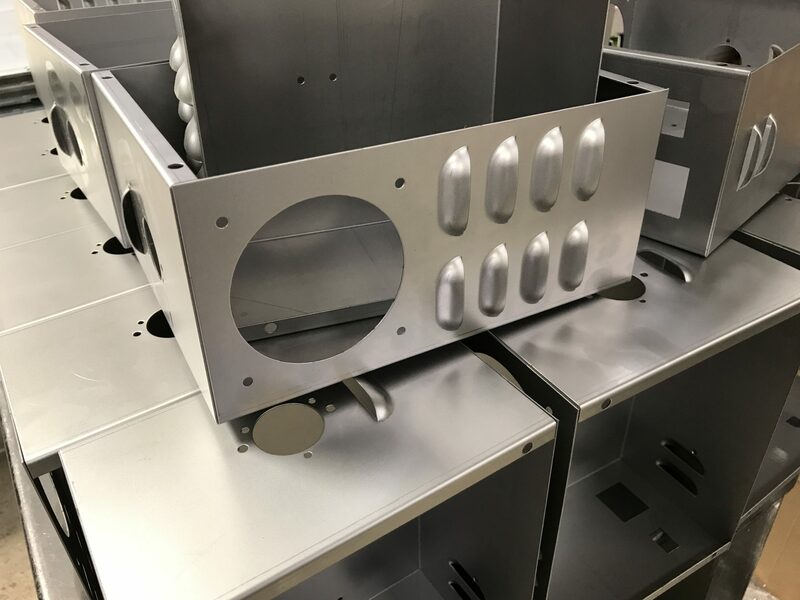 Along with the ability to use standard tooling that we have built up over many years the ease of CNC programming and speed to change designs are the main benefits. The Radan CAD/CAM software we use allow us to get the best from any sheet of material. This is vital with some of the special pre-anodised reflector aluminium material used fro light fitting reflectors being very expensive. If you have a light fitting and it needs a sheet metal reflector we are the people to talk to. We have a range of light fitting reflector materials on the shelf you prototyping. Call us on 01489 577786 to have a talk about your project. CNC punching techniques cover a wide range of ideas and tooling. The ideas shown here are just a few of those that are available to us when CNC punching your sheet metal work. We work with you to develop your ideas to get the best design for manufacturing to keep your costs down. 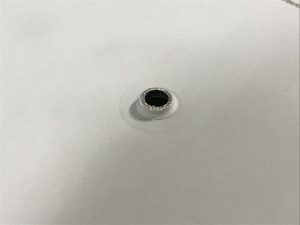 This simple technique to produce a small raised area in the sheet is can be used with a self tapping screw. The deformation in the sheet creates a local thickening allowing the screw more material to cut into. This is ideal when self tapping into thin gauges such as this 0.9mm zintec panel. These formed plunges can also be used with a tapping tool on our Trumpf 3000R to produce standard metric threads straight into the sheet. We can also use these plunges to provide location points when spot welding parts together. This speeds up the spot welding or welding operations, again saving time and money. CNC punch presses are great at nibbling (producing holes at speed close to each other). 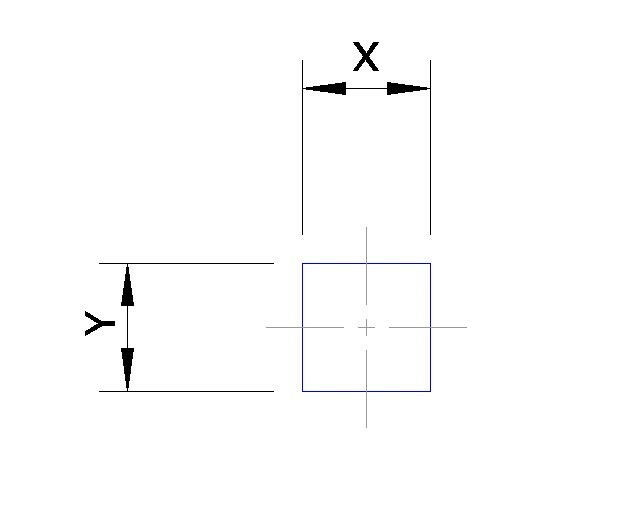 The holes can be separate or as in this example overlap. These CNC punching techniques allow a wide range of shapes to be produced in the sheet. From nibble out large cut-outs where a single hit tool would be tool large to nibble long slots or unusual shapes like those shown here. Non standard shapes can be produced with special tooling. 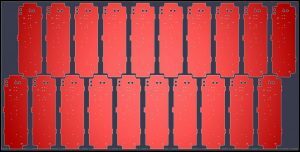 This fan array pattern was produced using curved tooling called banana tooling. If your production requirements have enough volume it might be worth us investigating dedicated CNC punching tooling. CNC punching techniques such as forming a CSK straight into the sheet is perfect for saving money. 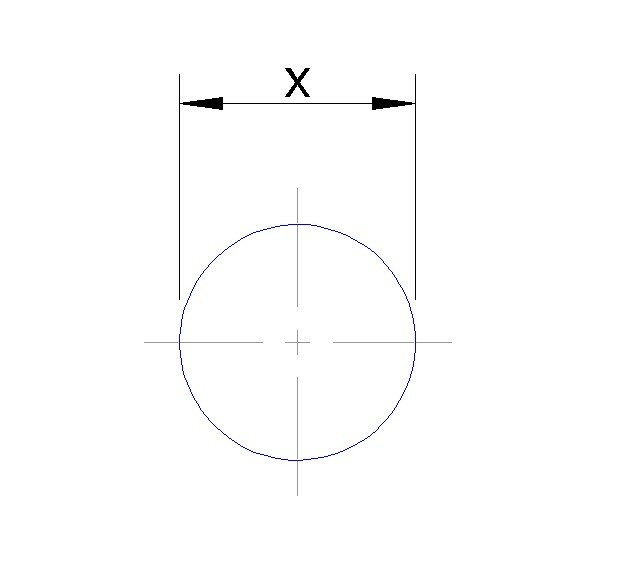 We simple CNC punch a pilot hole and then form the CSK with a single hit. The time taken to form each hole is 1 second which is much quicker than trying to drill in the CSK form. Not sure, please give us a ring on 01489 577786 and we will be happy to guide you. 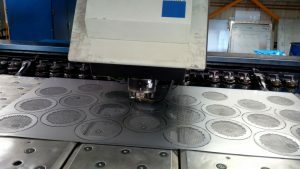 There may well be a part you are having manufactured that with a little bit of thought will suit one of these CNC punching techniques enabling us to save you time and money in production. Sheet metal production in 2017 from V and F Sheet Metal covers a wide range of materials and designs. It can simple be mild steel right angle brackets used to support storage shelves. 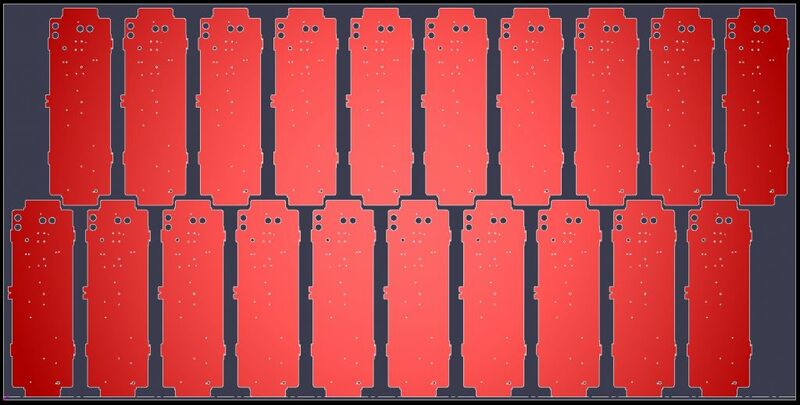 Laser cut aluminium electronics chassis front panels. Welded stainless steel oil tanks with a series of fabricated components. 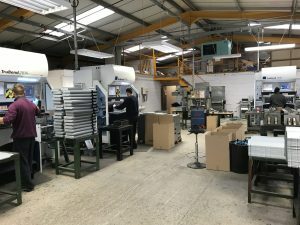 The designs that we are involved with are very diverse and the volumes can range from just a few samples right up to many thousands in a batch of components. CNC bending is a great production method when it comes to folding sheet metal work. It’s quick and easy to set up jobs so small batches can be manufactured at competitive prices. With a wide range of standard CNC press brake tooling over 4 of our machines we can be flexible when it comes to larger volume orders. We also have many special tools that we have made in house. 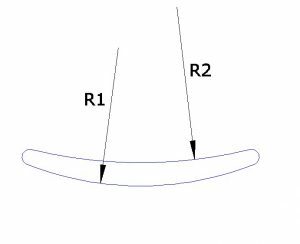 This enables us to form different curved shapes to widen the range of sheet metal work we can offer you. CNC punching is a fast and versatile sheet metal production method. 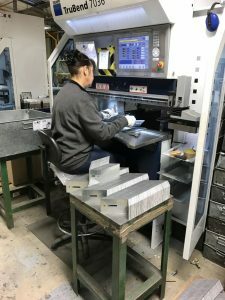 V and F Sheet Metal have been using CNC punch presses for many years to produce components for it’s customers in the UK. The mild steel discs shown here are typical of the sheet metal production that is produced every week of the year. Using standard CNC punch press tooling these parts were programmed quickly and the best fit from a standard sheet was produced to save money. The CAD/CAM software we use also allows us to experiment with designs and nest patterns when quoting for the parts. This enables us to pass those savings onto our customers at an early stage of manufacturing. Here is a nice example of the range of materials we use here at V and F Sheet Metal. These menu display panels have been manufactured from CZ108 brass sheet. The panels have been laser cut and CNC folded. The corner seams have had the plastic peeled away ready for TiG welding. 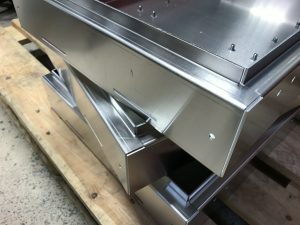 For more information on sheet metal work and how we go about producing it please follow the link. So you can see that sheet metal production in 2017 covers a wide range of techniques and product designs. 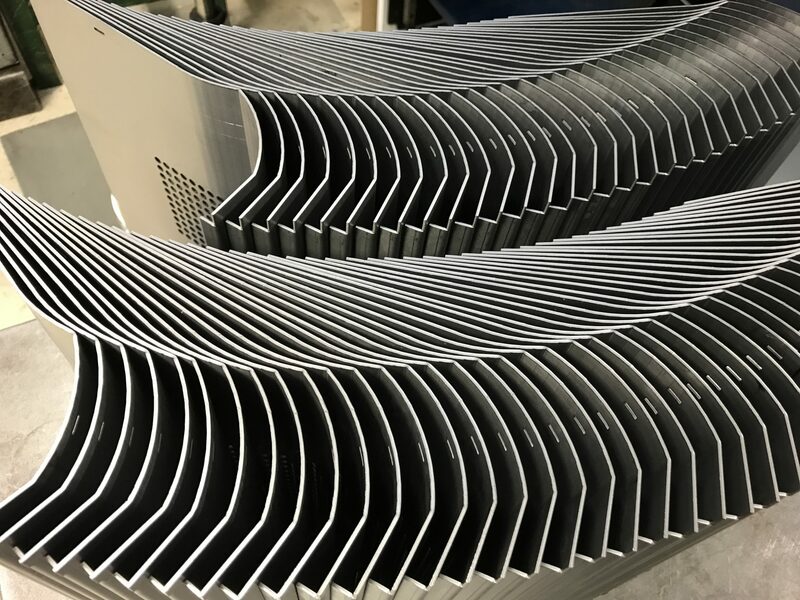 If you have a sheet metal design that needs producing in the UK please give us a call and we will be happy to review it and offer price options for it’s manufacture. Please call us on 01489 577786 or if you wish send you drawings to sales@vandf.co.uk and our engineering team will take a look for you. 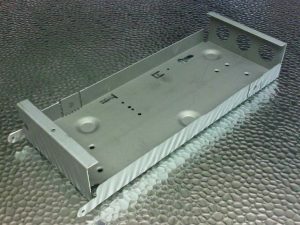 Take a look and see how easy it is for us to produce sheet metal housings. With standard CNC press brake tooling this job took under 10 minutes to CNC program and tool up. A couple of minutes to fold the first sheet metal housing and make a few corrections to the sizes and angles. Then we were off on a batch of 100 units. The ability to move from job to job in a short time makes this method of sheet metal work very flexible. Keeping set up times down to the minimum help reduce prices. The Safan e-Brake CNC press brake has 100 tons of folding force and a 3M long bed. It works perfectly with our Trumpf 3030 fibre laser machine. The laser can cut up to 3M long and the press brake can fold up to 3M long. If you have a sheet metal project that requires folded components we have the perfect machines for the job. Whether you have small brackets and angles which suit our 3 Trumpf 7036 CNC press brakes. If you have components up to 3M long then our Safan e_Brake is the machine. Give us a call on 01489 577786 or send your drawings to sales@vandf.co.uk and our engineering team will be happy to help you. Sheet metal manufacturing can come in so many different forms and I have chosen 3 to look at today. Things have moved on a lot from manual cutting, marking our, drilling and fly-press piercing and mechanical bending. With modern laser cutting, CNC punching and CNC bending sheet metal manufacturing in 2017 utilises high tech equipment, software and skilled staff. For a full description of sheet metal manufacturing and all its production processes follow this link. CNC punching machines have been around for many years in one form or another. Our single head Trumpf CNC punch presses enable us to manufacture some very complex sheet metal work. 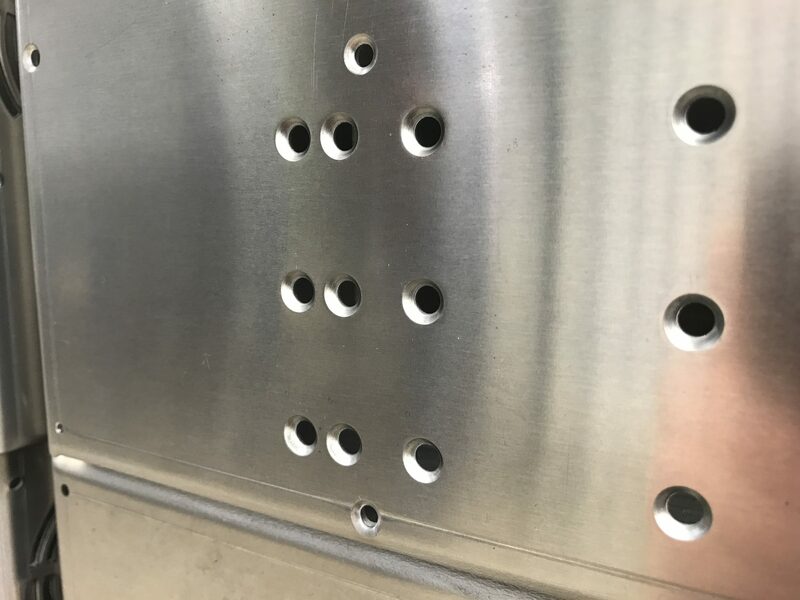 It goes without saying that designs require holes punched accurately and quickly to keep costs down, the Trumpf machines don’t disappoint. With fast controlled punching they also offer thread tapping, forming, bending and engraving. They can be thought of as a factory in one machine. And where they cannot cope on thicker gauges the laser machine is ready to take over. Laser cutting is perfect for cutting through thick materials in ferrous and non-ferrous grades. But having a fibre laser cutter enables us to not only process thinner material extremly fast but copper and brass alloys up to 6mm thick. No look at sheet metal manufacturing would be complete without a look at our bending facilities. We are very proud to have a large range of CNC bending machines here in Fareham, Hampshire. 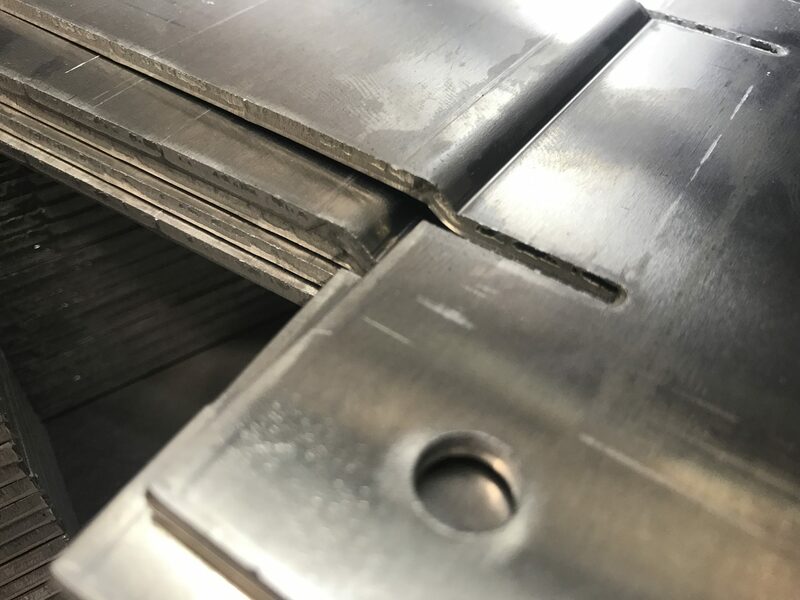 We manufacture sheet metal components ranging from just a few mm across in materials as thin as 0.3mm right up to sheet metal sections 3M long. All sheet metal materials are processed through a wide range of standard CNC press brake tooling. Our 3 Trumpf 7036 and Safan e-Brake CNC press brakes share the same bend tooling for ease of production. This also allows us to move jobs between several machines when needed e.g. during busy times or if machines are being serviced. This short blog post is only to whet your appetite, if you want to know more please explaore our website or give us a call and we will be happy to help you. Here’s a short video showing our Trumpf 3030 fibre laser cutting machine cutting through 1.5mm 5251 aluminium alloy. Using nitrogen as the cutting assist gas a very clean quick cut is achieved with very little post operation de-burring required. These aluminium display panels are used as traffic calming signs. We manufacture a wide range of display panels in aluminium and stainless steel alloys ranging from 1 off special projects to mid ranges volumes, 50-100 per order. You can see that the main display panels are on the left hand side of the sheet. Other brackets and support components have been laser cut from the right hand side of the sheet. This enables us to use as little material as possible and keep costs down. 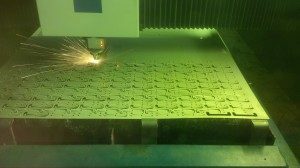 With all laser cutting projects and this one was no exception we have to start with Radan CAD/CAM software. 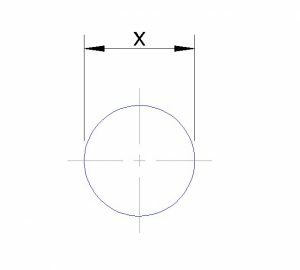 We are lucky that this customer always gives us DXF files so we can examine all features and dimensions when producing the 3D models and laser cutting CNC programs. These sheet metal aluminium display panels after laser cutting were folded up on one of our 7 CNC press brakes. They then had many PEM bushes and studs inserted to our customer’s design. After welding and cleaning up we organised powder coating so they were ready fro our customer to assemble. If you have a project that needs aluminium display panels either laser cut or CNC punched please give us a call. We are always happy to help you with your design or produce quote options to get the best fit of manufacturing and price for your budget. We have been busy manufacturing many sheet metal fabrications in 2017 from our base in Fareham, Hampshire. These sheet metal fabrications have a wide range of uses for many of our customers in the UK. This blog post features sheet metal fabrications used to build industrial light fittings, centrifugal blood testing equipment, heating chassis and oil pumping control housings. 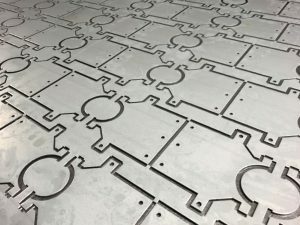 A quick look at the range of components that were fabricated recently show that we are always laser cutting and CNC punching sheet metal work. Whether it’s stainless steel, aluminium alloys or any of the many types of steel and it’s treated derivatives we can cope with it. Laser cutting is a modern way of producing sheet metal fabrications. It produces highly accurate blanks in a range of materials and thicknesses without the need for expensive tooling. Linked and driven by Radan CAD/CAM software the component blanks that are laser cut are ready for bending without further processing. Many sheet metal fabrications have folded features which we carry out on our CNC press brakes. We have a range of 7 CNC press brakes and the one featured here is a 3M long machine. This Safan e-Brake 3M CNC press brake has 100 tons of electrical force and was installed brand new in 2016. Sharing CNC bend tooling with our 3 Trumpf 7036 CNC press brakes enables us to be very flexible when it comes to work load production planning. These sheet metal fabrications were laser cut from 3mm zintec and have several 90 degree folded produced during the same bending cycles. 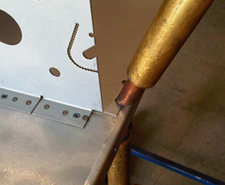 Spot welding is a cheap and easy way to join 2 of more sheet metal components together. Using spot welding is particularly useful with ferrous materials and internal components that do not have a cosmetic appearance. If a good cosmetic appearance is required sometimes swivel spot welding tips can be used. If this still isn’t good enough then a post spot welding cleaning up is required. Either disc grinding or orbital sanding will remove all evidence of any spot welding if required. If you want to know more about sheet metal work and how it’s made follow this link to our specific web page. If you have sheet metal fabrications that you need to have manufactured please give us a call on 01489 577786. Alternatively you can send us a e-mail with your requirements and we will be happy to help you. Today I thought it would be useful to run over a couple of common CNC punching techniques that are often used here at V and F Sheet Metal. Knowing that none of us want to spend money where we don’t need to we always try our best to use existing tooling to produce new parts. This ventilation pattern was created by turning a 4.5mm square tool at 45 degrees and repeating a simple column and row pattern. By using a range of different sized tools and pitches a wide range of open area performances can be achieved. This is particularly useful if the order volumes don’t justify bespoke cluster tooling or if you are still prototyping and need to try out different air flows for you design. If you want to read more on CNC punching please follow the link to our CNC punching pages. A standoff foot is often needed to enable a sheet metal base tray to be lifted off the floor or wall. We have a range of dimple tools that enable us to achieve this for you. If a fixing hole or even keyhole slot are needed again this is easy to produce and we have many tooling options available for you. 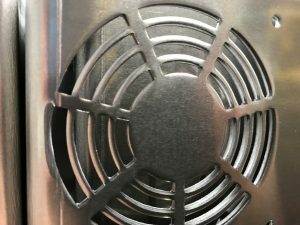 When it comes to ventilation areas in sheet metal we have a vast range of options. For some it’s simple a CNC punched window which a fan can be screwed to with a separate grill. 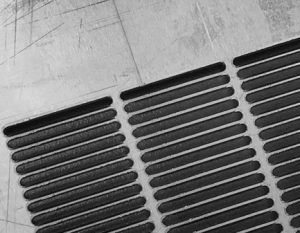 Others might want a series of ventilation louvres formed into the sheet, which can be achieved with CNC punch press tooling. A popular alternative is to have an area punched with holes of slots to allow the correct amount of air flow. This can be with special cluster tooling if the volumes are high enough to justify the tooling costs. If the volumes are lower then using one of our many standard CNC punch tools is the cheapest and easiest solution. This pattern of vent slots was produced with one of our standard obround tools. For more information on standard punch press tooling take a look at our tooling pages. 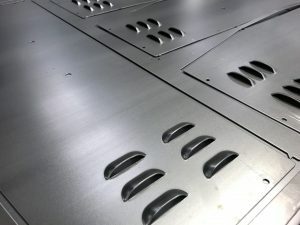 If you want to discuss some of your sheet metal designs that might benefit from other simple CNC punching techniques please call us on 01489 577786 and we will be happy to help you. We are often asked to manufacture sheet metal components from aluminium. If the components are from the same gauge and grade of aluminium they can be CNC punched out of the same sheet. This method of CNC programming helps to keep the parts together in production. It also helps at times with increasing the efficiency of material use and reduces the amount of programming that we need to manufacture a set of components. 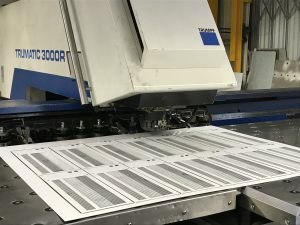 The Trumpf 3000 CNC punching video shown here demonstrates clearly this technique with several parts being CNC punched together all for the same purchase order. 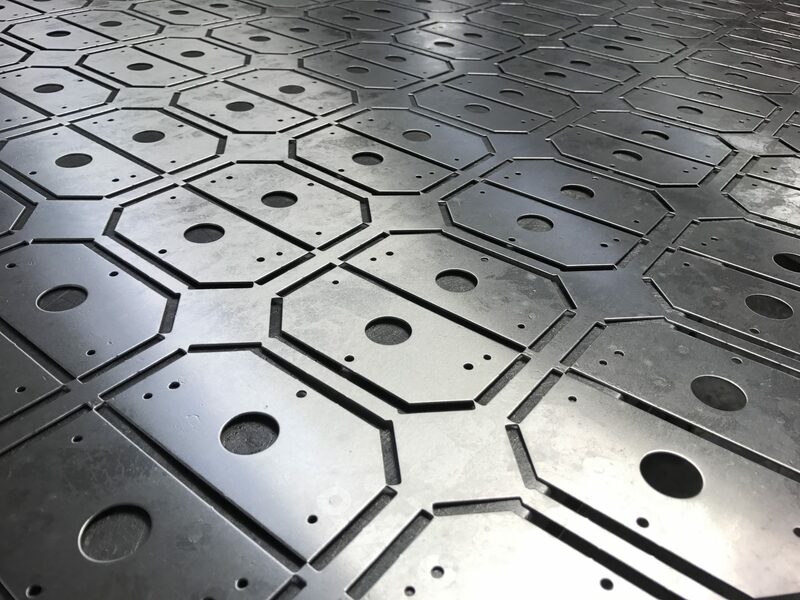 This has all been organised before the job even enters production so the machine setters and operators don’t waste any valuable CNC punching time. Using Radan sheet metal CAD/CAM CNC programming software enables us to easily produce complex nests of parts on our Trumpf CNC punch presses. We can take programs from one machine and change them to another in seconds enabling a flexible approach to urgent jobs. You can see more about our CNC punch presses on our plant page. There are even times when a single part of set of parts may be moved from CNC punching to laser cutting or from laser cutting to CNC punching to suit production. 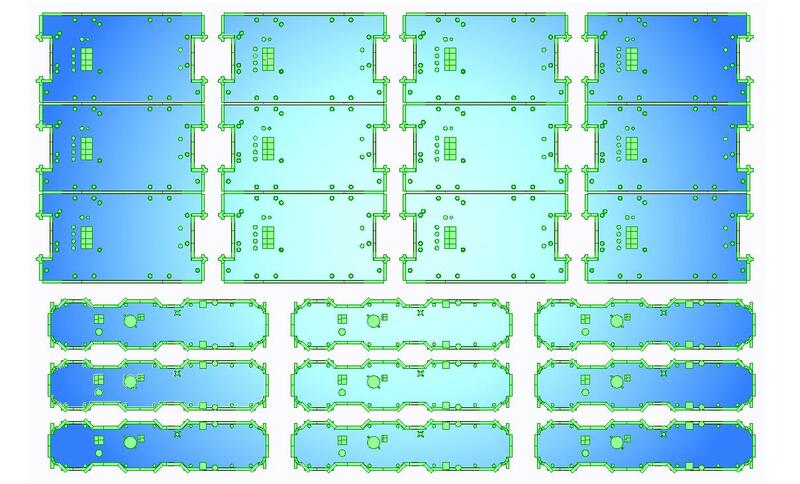 This again is so easy with Radan CAD/CAM software and can be achieved with very little fuss. We can and will employ all these techniques at times to speed up production and produce the best material yield for the cheapest part prices. 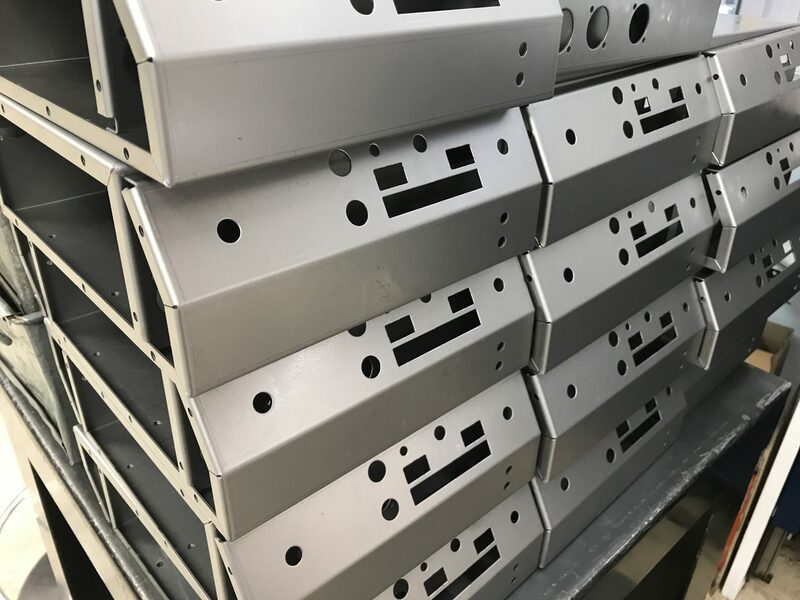 If you have a range of aluminium parts or just a single part you need please don’t hesitate to contact us and we will be happy to calculate some part prices for you. As well as CNC punching aluminium we can laser cut your aluminium projects when it’s a cheaper option. Please send you drawings to sales@vandf.co.uk or call us on 01486 577786 and we will be happy to chat through your design ideas.